Goodreads Summary: We teach toddlers to identify colors, numbers, shapes, and letters—but what about their feelings? By illustrating such common emotions as happiness, sadness, anger, fear, and calm, this sensitive book gently encourages young children to open up with parents, teachers, and daycare providers. 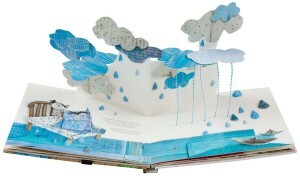 And kids will LOVE the bright illustrations and amazing 3-D pop-ups on every page! Llenas did a beautiful job making entire scenes and monsters that embodied the emotions. I also liked the uniqueness of the pop ups. They were multimedia with collages and rope. Ricki’s Review: Opening a pop-up book is exciting. Opening this pop-up book is mind-blowing. This text is a work of art, and I kept spinning the book in different ways while wondering, “Wow. How did she do that?” My son couldn’t keep his hands off of this book. It is quite magical. Every child deserves to have this book. It would make a great gift. 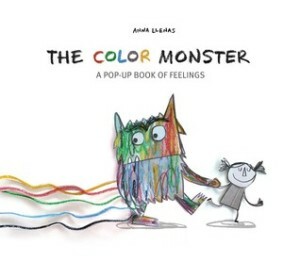 Teachers’ Tools for Navigation: The Color Monster would be a great text to mix socio-emotional lessons with academic lessons. While reading the book, the class can discuss the different emotions, why the author illustrated them the way she did, and how emotions look in real life. Then students could choose emotions and illustrate them with their own setting and monster. 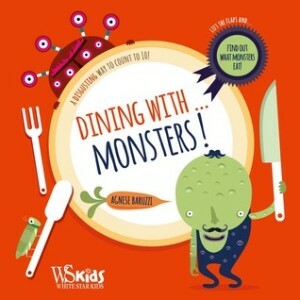 Dining With…Monsters! : A Disgusting Way to Count to 10! Goodreads Summary: What do hungry monsters like to eat? 1 spider swallowed whole, 2 leaping frogs, and 3 entire whales for the ogre with gigantic claws and scales! And for Mr. One-Eye, four mice are very nice. Kids will enjoy this fun feast of a counting book, with 10 colorful creatures and their meals of grasshoppers, scorpions, owls, and prickly porcupines. Foldout pages and simple, humorous rhyming text make this a delight to read aloud. Kellee’s Review: This book is so much fun! Trent had such a fun time reading this book with me because the flaps are like a little surprise each time you lift them. We would open and close them like the monsters’ mouths and make nom nom noises. The illustrations of the scary-ish, (though more) funny monsters are elaborate and colorful, and the text is quite funny. Ricki’s Review: My son absolutely loves books with flaps, and he is a tough critic. If the flaps aren’t interesting enough, he tosses the book over his head. He was engaged in this book from the front to the back cover. At each flap, he started bouncing up and down in excitement. I am really happy to have this book because it will be very helpful for me as I teach my son to count. This is an excellent counting book, and I highly recommend it. Teachers’ Tools for Navigation: What a fun text to use in early education classrooms to talk about colors, adjectives, rhyming, and counting! This text would be perfect for around Halloween because each page has a different monster that is described with adjectives then, with a flap flip, you find out a rhyming thing the monster eats. This text could also then lead to a writing activity with describing a monster and finding a rhyming thing for it to eat. Additionally, there are some great vocabulary words (shrieks, icky, grisly). Goodreads Summary: Vampires and werewolves and zombies—oh my! It’s a monster invasion, and the stinky-smelling creatures are destroying Wally’s peaceful little town. They scare the kids, knock over the lampposts, and make a mess of everything. And no one can stop them—until, fed up, Wally says . . . the magic word, “PLEASE.” Learning good manners has never been as monstrously fun! Kellee’s Review: I love the realistic setting and character illustrations mixed with the huge, imaginative monsters in the book. It really brings the book to life. I also think the protagonists will be kids that readers can connect with because they just seem so real and easy-going. Also, this book will be a very fun book to read with kids because it really doesn’t go the way you think it is going to go when you start reading it (and the message is one that we want all kids to learn). Side note: I appreciate the author including diversity in the town featured in the story. There are all different types of people which really does reflect society realistically. Ricki’s Review: Parents and teachers love books about manners, and this book is no exception. Both teachers and parents will nod enthusiastically when Wally says, “Please.” The illustrations are gorgeous, and readers will be drawn to the beauty of this text. I loved the many different kinds of monsters that were featured in the story (from more traditional to contemporary). This will provide teachers and students with many opportunities to make connections to other texts about monsters and scary things! Teachers’ Tools for Navigation: Like many teachers, we enjoy making social contracts with my students. Together, we created a list of rules and then signed the contract. It involves students in a more democratic process. We think that this book would be a great way to kick off a discussion on rules and manners. This could precede the creation of the social contracts. Goodreads Summary: Nothing frightens Winifred Schnitzel—but she DOES need her sleep, and the neighborhood monsters WON’T let her be! Every night they sneak in, growling and belching and making a ruckus. Winifred constructs clever traps, but nothing stops these crafty creatures. What’s a girl to do? (Hint: Monsters HATE kisses!) The delightfully sweet ending will have every kid—and little monster—begging for an encore. Kellee’s Review: What a fun premise and a great way to promote love instead of fear! I can just picture this book being paired with Monsters, Inc. to discuss perceptions and fears of monsters. Maybe teachers could even talk about where the folklores that started the “monster/bogeyman in your closet” fear. 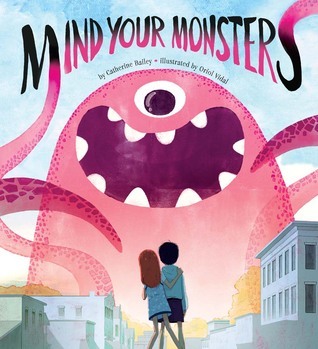 My only worry about reading this book aloud at bed time is that this book will make young readers think monsters are going to invade their room, but I think it is something we can discuss and hopefully move on from after talking about how there isn’t anything to be afraid of. 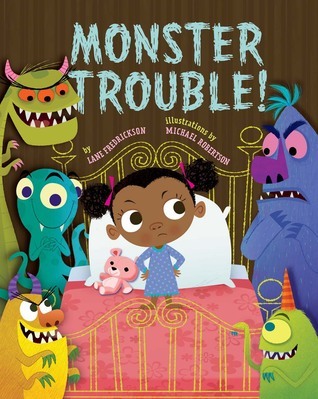 Ricki’s Review: The monsters in this book are illustrated in a silly way, which makes the concept of monsters much more approachable for kids. I was giggling as I read this one to my son, and that made him giggle, too. (Then, of course, I smothered him in kisses.) I loved the premise of this charming book and will absolutely be keeping it in my library for when my son develops a fear (monsters or not). Teachers’ Tools for Navigation: Teachers could hold a classroom discussion of fears, and students might critically examine their fears. Winifred is quite brave, so the students could discuss how they would show bravery when they encounter their fears. Love that Monster Trouble, but the others are new to me. Wow, what fun!